In 2005, coral reefs throughout the tropical Atlantic and Caribbean were severely impacted by a mass coral bleaching event triggered by prolonged exposure to above normal water temperatures. The bleaching observed in 2005 caused some direct mortality and was also followed by an increased incidence of disease outbreaks. 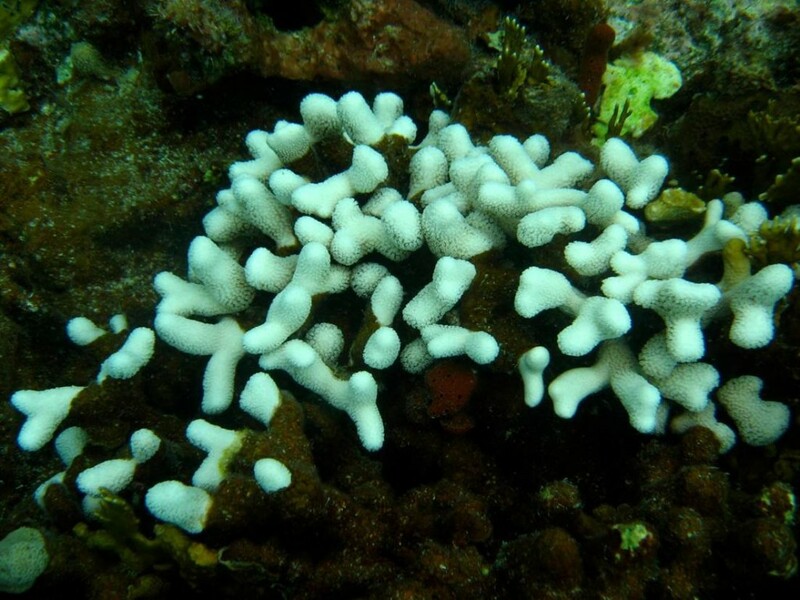 Multiple studies reported this pathway of bleaching followed by increased incidence of disease, with corals varying in degree of mortality resulting from both stresses. 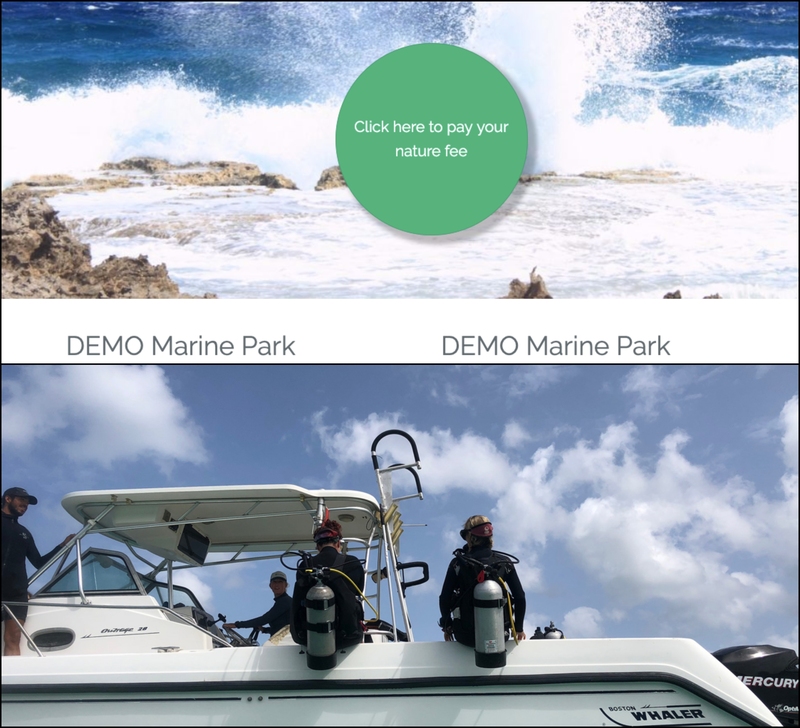 This event caused resource managers to realize a formal plan was needed to better respond to coral bleaching events and communicate with stakeholders. The U.S. Virgin Islands (USVI) BleachWatch Program was developed to assess and monitor coral bleaching primarily from warm water events and document the distribution, severity and impacts of bleaching to reefs and reef communities. The program was developed by adopting and modifying strategies from the Great Barrier Reef Marine Park and Florida’s successful BleachWatch programs. To guide the development of bleaching response efforts a steering committee was formed. The committee was composed of reef experts from local and federal government resource agencies, non-profit organizations, and academia. The Bleachwatch Program is one of five main components of the US Virgin Islands Reef Resilience Plan (VIRRP), a larger planning effort to conserve coral reefs in the USVI and promote coral reef resilience. NOAA’s Coral Reef Watch (CRW) Program, provides current reef environmental conditions to identify areas at risk for coral bleaching, and is used to prepare and respond to mass bleaching events. The following CRW products are monitored by The Nature Conservancy (TNC) in the USVI to provide a early warning system: Alert Areas, Hot Spots (current thermal stress), Degree Heating Week (DHW), Sea Surface Temperature (SST) and Sea Surface Temperature Anomaly (SSTA). These products are available free to researchers and stakeholders to understand and better manage coral bleaching in the region. USVI Bleachwatch response activities are directly based on advisories and alert levels received from NOAA along with local temperature data. When a Bleachwatch alert is received from CRW by TNC, volunteers are mobilized. They are the first eyes in the water, reporting basic observations such as presence or absence of bleaching. Volunteers are asked to collect data for any areas they visit and also asked to survey specific sites of interest such as coral nursery outplantings and sites assessed with high resilience. If a more severe event takes place, TNC alerts the steering committee and the scientific community. During this time, volunteers might continue to assist with monitoring, but data is more specific and collected at a finer scale to estimate of the percentage of coral reef affected. Alerts are issued by NOAA only when a station experiences a change in thermal stress level. Table 1 presents a summary of the advisories/alert levels from NOAA monitored by TNC, definitions of the each levels and the response of the USVI Bleachwatch program to each advisory. Individual volunteers from the public are a main component of the USVI Bleachwatch Program and contribute to the assessment of coral bleaching. BleachWatch assessment methods are taught through in-person training sessions (Since 2013, 4 volunteer trainings have been conducted in St. Croix and St. Thomas). Training sessions are 1 hour in length and focus on the identification of corals reef, fishes, and other creatures. Differences between bleaching, disease and mortality are discussed. Each session also includes training on survey methods, materials, methodology and guidelines for submitting data. 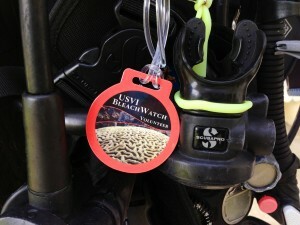 A USVI Bleachwatch website was developed to communicate with volunteers and the public. Volunteers have the option of submitting reports through an online datasheet, by email or mail. Since the launch of the USVI BleachWatch Program over 35 individuals on St. Croix and St. Thomas have been trained to identify and quantify the severity of bleaching. In 2014 the program protocols were tested for the first time. A Bleachwatch alert was sent out and volunteers were successfully mobilized to survey sites for bleaching. Over 30 reports were received and, fortunately, no bleaching was observed. The secondary response components of the program have been fully tested, as there has not been significant bleaching of corals in the territory since 2005. 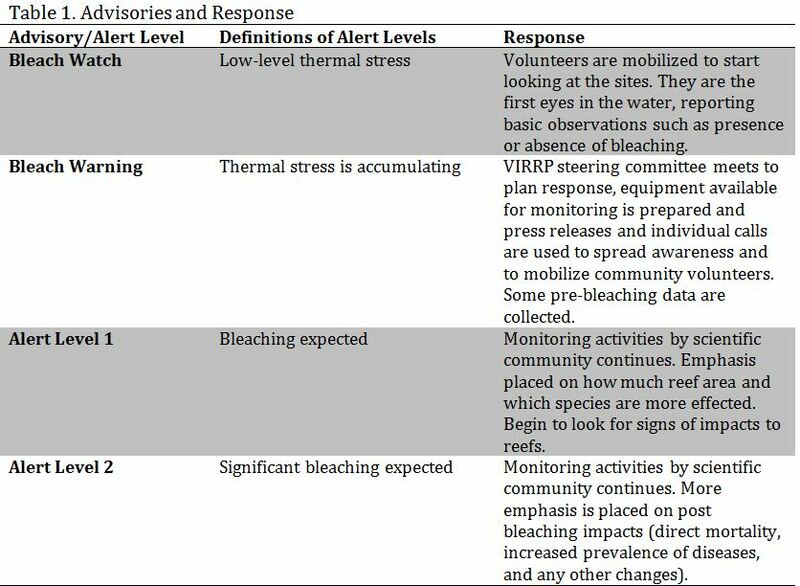 The USVI Bleachwatch Program has resulted in increased support and capacity for resource managers to identify and respond to bleaching events. Volunteers are functioning as an early warning system for bleaching events. Managers and the scientific community have a clear plan for assessment and response to bleaching events to inform the proactive management of coral reefs during severe bleaching events. The most important lesson learned is to be mindful that not all volunteers will collect data uniformly. In some instances volunteers are comfortable only sharing whether or not bleaching was observed, which is also important information. It is important to be mindful of volunteers’ time and welcome any level of information that they are willing to share. Have a point person in place to keep program organized and lead communication with steering committee members and volunteers. During the development of the program it is critical to determine who can serve as point of contact for the program, this requires staff time for coordination. Consider where point of contact responsibilities can be integrated into existing or complementary efforts for example coral reef monitoring efforts. Clearly defining benefits, incentives, and creating a feedback loop to the volunteers is important. Be flexible and realistic about of the quality of data you hope to receive and the format in which you will receive it from the volunteers – some will fill out the entire form, some will just send an email. Provide other alternatives and options for reporting such as a mapping tool to make it easier for people to report the event. 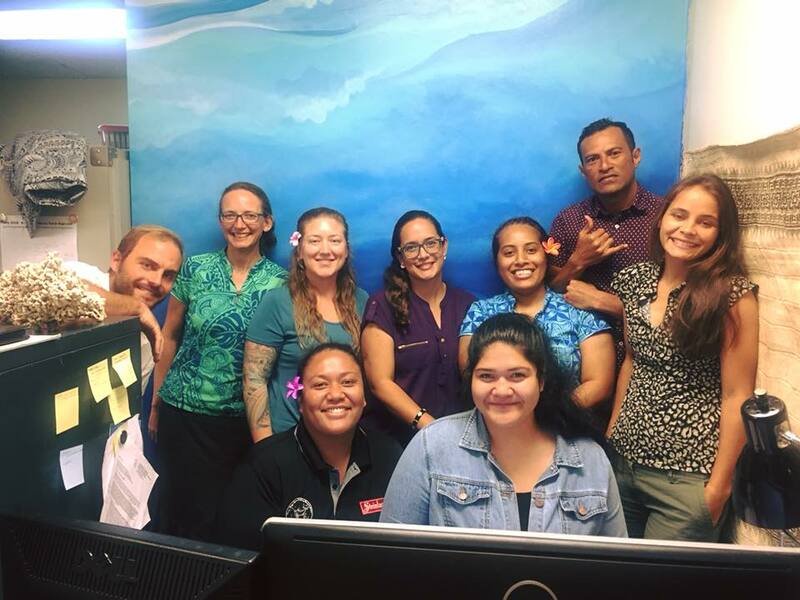 Group volunteer time effort – consider expanding the topics included in a training to include other issues affecting coral reef health that volunteers are interested in reporting for example; invasive species, grounding damages.